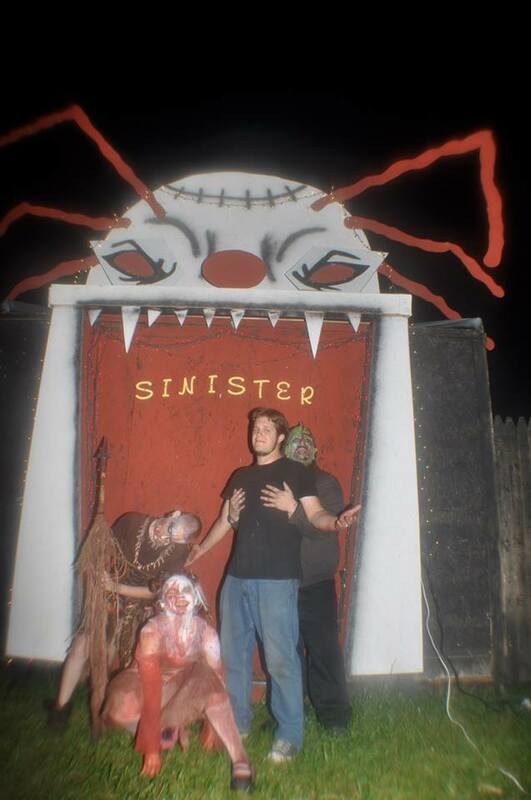 Last year we were ambushed by the killer show at Sinister when what we thought was an unknown upstart turned out to be an old favorite in disguise. Now with their true nature revealed to us, would the savages at Sinister be able to deliver another haunt classic? There were five members in our party on this night and as it would turn out we entered in pairs of two, which left one of us without a pal or a prayer — and that honor was bestowed upon yours truly. One of the elements that I loved about Sinister is the fact that the show began while we waited in line. When I was a boy it seemed that any haunted house I visited featured loud shouts, threats, and banging meant solely to soften up and psyche out those souls yet to enter the attraction. And like those that came before them the cast at Sinister treated those in line as meat soon to be tenderized. Many of the actors here will exhibit no use of the English language, utilizing instead a babbling dialect punctuated with grotesque guttural noises — the effect is jarring, even unsettling perhaps activating a primal fear of the unknown. I loved this touch as it put me in mind of the Ganados people of Resident Evil 4 who never ceased to give me the creeps. One masked masochist possessed the unique ability to switch from the common tongue to the unnerving babble speak and he seemed to command the respect of the other lunatics. In all honestly there wasn’t a better person to portray this character as the actor under the hood, who insisted he be addressed as “Daddy”, demanded obedience while he spewed perverse proclamations which belied a comic wit. You may be asked to do things at Sinister that seem strange at first and it’s best to check your ego at the door, it’s all in good fun and if you open yourself up to it you might just enjoy it — seriously, just go with it and see what unfolds. I for instance was made to army crawl and roll through the majority of the attraction and one of my cohorts may have been put in the awkward position of binding my wrists and ankles with duct tape. Nothing to see here, just an average night at Sinister. As someone who has visited dozens upon dozens of haunted attractions I can say without hesitation that the cast at Sinister is among the elite in the field. It began with the disturbed girl dressed in old fashioned clothing who I affectionately refer to as Bizarro Laura Ingalls (shh, don’t tell her), a veritable ball of energy who engaged me with wanton fearlessness. Later, I encountered a woman with a blood soaked bed hell bent on extracting repentance and then there was a bushy haired doctor of sorts with a wry smile and a twisted gleam in his eyes. It all built to that frenzied finale where Bowbee claimed his pound of flesh! The combination of improvisation and intensity displayed by the actors is what truly sets Sinister apart from other haunted attractions. Never before have I witnessed actors adapt so readily, not only to individuals or groups, but also to repeat customers so seamlessly. Even the most professional haunted attractions will have a couple of actors that aren’t quite up to snuff either due to ill timing or a weak delivery — and that’s just something you’re not going to see at Sinister. When you enter a room the actor is already engaged with the environment (tipping over a table for instance, which I witnessed). The style at Sinister is akin to a theatrical production and you are a part of the show. The thespians on this stage may be sick and twisted, deranged and dead but this is undoubtedly haunted theater. The show did have a couple of factors working against it on our visit, such as a key absence and an untimely injury, but those are widely beyond the control of mere mortals. With an excellent cast in place I’d like to see Sinister continue to expand both creatively and physically. We hope to make it back this season to experience the alternate ending as well as the brand new haunted corn maze now on premises. The ghouls just love me. This entry was posted on October 16, 2013 at 11:47 pm and is filed under 2013, Review, Sinister with tags bowbee, halloween, haunted house, horrorlust, resident evil 4, sinister, utica. You can follow any responses to this entry through the RSS 2.0 feed. You can leave a response, or trackback from your own site. Thank you so much! We’ve all been at this for 8 years or more, we truly love what we do. We had alot of fun with you. 😀 you are free to come back anytime! You guys are most welcome; can’t wait to see all of you again.